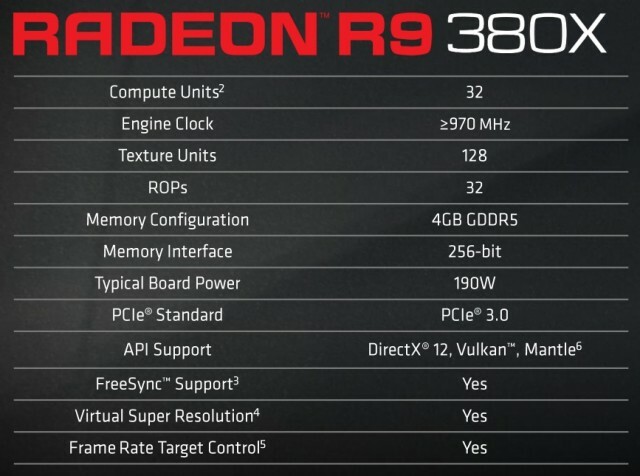 Mainstream gamers rejoice, AMD just launched the Radeon R9 380X graphics card! This card should settle in nicely to the $229-$249 price range, making it affordable while still offering solid performance for the latest titles. AMD states the R9 380X will be a solid 1440p gaming card with its 4GB of VRAM and horsepower to push the pixels. MSRP for the reference cards will be $229, while overclocked versions will start at $239. 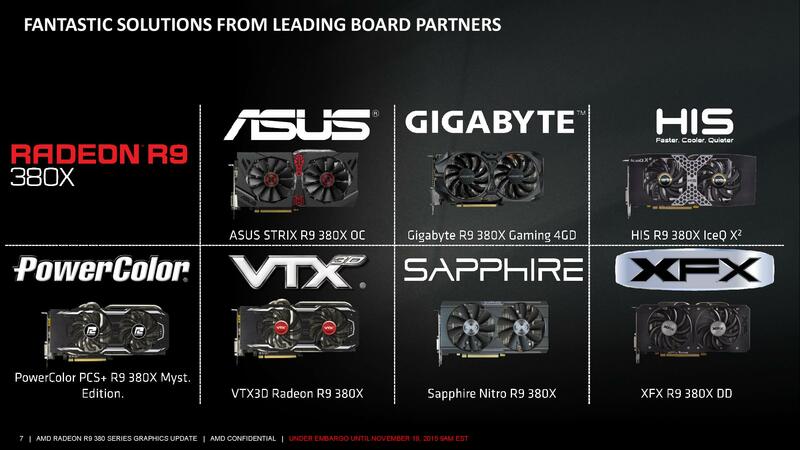 AMD expects these cards to beat out the GTX 960. Additional slides are available below. Stay tuned for a review early next week where we put the R9 380X through our gauntlet of GPU benchmarks! Pricing for aftermarket cooling solutions start at $10 over the reference MSRP as the article mentioned...Have you checked out how much aftermarket GPU coolers cost? I think paying $10-$30 for one isn't bad, AND they usually give you higher clockspeeds. Is this just re-badge of the 280x series but w/more memory? Or is it a cut-down version of the 290x series? Why isn't AMD doing more w/their high end series instead of fleshing out their mid-range cards? I'd like to see AMD challenge Nvidia for the performance gaming crown now rather than waiting for DX12 to become a thing. What else are you wanting from AMD? They have the Furyx and Fury cards and a rumored dual fury/furyx card coming soon. I had thought the FuryX, for all its watercooling, wasn't able to match the GTX 980Ti in terms of performance, which is disappointing considering the cost of the FuryX is more than the GTX 980Ti. Now that I think about it though, has ATI or AMD ever held the gaming graphics performance crown for a single GPU? I dont recall too much, but the 9800XT and XTX I thought wiped the floor with the Nvidia compaables.. X1950xtx? Not sure since Fermi though. What happens when you try 1440p at high levels of AA though? Or use DSR w/AA? I think I'll conduct a little experiment in w/HWinFO64 and see if the GPU Memory Controller Load varies significantly w/DSR and amount of AA applied. Not sure about memory loads, I just know what cones out the other side in fps and that it does not hitch.